When I first saw CATCH PICASSO'S ROOSTER and TICKLE TUT'S TOES by Julie Appel and Amy Guglielmo, I just thought they were absolutely adorable. Big, bright board books that not only featured artwork and artifacts, but were also interactive. I just knew my little guy would love to read (and play) with these books. And I have to admit that I was excited to read books about some things that I might find interesting! These books were a huge hit with my five year old. He is the ideal age for these books -- the publisher's recommended age is 4 to 6 years old. He has always loved interactive books, and we've found that he is just getting too old for many of them. I think that's why he appreciated these books so much. He could touch and play with the books without feeling like they were too babyish! Having said that, I certainly think children even younger than 4 years old would enjoy both of these books too. CATCH PICASSO'S ROOSTER has many famous painting by artists such as Picasso, Rousseau, and Van Gogh. Each page is filled with rhyming words, animal sounds as well as some beautiful artwork. There are also many things that will appeal to a child's senses such as a feather, textured fabrics, and even a scratch and sniff page. I especially enjoyed the last two pages where the author gave additional information about each of the paintings in the book -- I kind of considered that the "parent part." We also had a lot of fun reading TICKLE TUT'S TOES. My son and I recently read a book about mummies so he was very interested when I told him that King Tut was a mummy! Like CATCH PICASSO'S ROOSTER, this book was filled with interesting pictures of artwork and artifacts. There were also different textures on each page for him to investigate. I think I enjoyed this book a little more than my son did. I am very interested in ancient Egypt, and I thought the detailed explanations of the artifacts at the end of the book were fascinating. I consider both of these book to be educational and fun at the same time. I like that CATCH PICASSO'S ROOSTER gives children a brief introduction to art and some famous artists; and I thought that TICKLE TUT'S TOES did a great job of showing some ancient artifacts while also explaining their meanings. What's probably the best thing about these both of these books is that kids will love interacting with the artwork. There is a very fun website devoted to the Touch the Art Books which gives you more information about this series. Besides CATCH PICASSO'S ROOSTER and TICKLE TUT'S TOES, there are some other books in the series including POP WARHOL'S TOP, BRUSH MONA LISA'S HAIR, FEED MATISSE'S FISH and MAKE VAN GOGH'S BED. There are also different types of art project ideas as well as teacher lesson plans, games, and activities associated with the books. Are you interested in winning your very own copy of a Touch the Art Book? Thanks to Sterling Publishing, I have a copy of CATCH PICASSO'S ROOSTER to share with one lucky reader. To enter this giveaway, just leave a comment with your e-mail address telling me which one of these books appeals to you. To double or triple your chances, you can blog and/or tweet about this giveaway with a link back to this post. This contest will be open until Tuesday, November 17 at 11:59 p.m. ET, and I will notify the winner the following day. This giveaway is open to those of you with U.S. and Canada mailing addresses only -- no p.o. boxes please. Good luck! Thanks to the publisher for sending me copies of these books! I love the idea of these books. And I know that kids love to touch the different textures and learn at the same time. No need to enter me. What a fantastic idea! They all sound so great but the Feed Matisse's Fish would be a hit with my son, I'm sure, as he loves fish. Any or all of these books sound wonderful. I'm sure that Catch Picasso's Rooster would appeal to my 4-year-old grandson. I am making myself a note re. these titles for Christmas ideas. Thanks for the giveaway. This sounds like a great one for some nephews or nieces. I'd like to be entered. They both appeal to me. I just love when kids get to learn as they read. Both Picasso and King Tut are wonderful subjects to learn about. If I had to choose I'd say Picasso because I just adore his art. But, I'd be happy if I won either. No need to enter me, as always. I'm dropping in to let you know I've got this posted at Win a Book. Thanks for the e-mail! this would be perfect for the grandkids,,thx for the contest..
Tickle Tut's Toes would be perfect to use for teaching a unit on ancient civilizations. Thanks for sharing these! What a great way to share art with your children. I would love to win a copy for my godchild. I'd love either one, but Picasso's Rooster would be my first choice. Thanks! Picasso’s The Rooster appeals to me more, how cute! My little nephew just loves reading and he is all about birds so I think Catch Picasso's Rooster would be the one for him! Picasso’s The Rooster appeals to me more. Picassos rooster sounds really nice for my kids. My children really like rhyming and touch and feel books and this introduces them to art. Catch Picassos Rooster for me! Oh this is a hard choice. They both look great. I think I would like Tickle Tut's Toes the best, but either one is absolutely great. This is a wonderful opportunity for young children to be exposed to the fine art of painting. 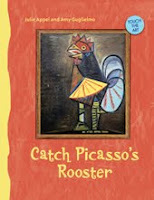 I would love to win the Catch Picasso's Rooster book for my three year old grandson. I just wrote a post about your giveaway! These sound wonderful! Perfect for my little nephew. Catch Picasso's Rooster definately appeals to me the most, but both books look lovely. My kids love animals and art, so Catch Picasso's Rooster would be great for them! 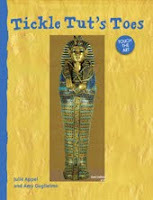 My daughter would love Tickle Tut's Toes because she loves all things having to do with Ancient Egypt! This is my first introduction to these books but do i ever want one! They look fantastic! My son would love Tickle Tut's Toes as he is totally into Mummies. They both look so cute. But my kids love ancient Egypt so my pick would be Tickle Tuts Toes. They both sound wonderful! Tickle Tut's Toes sounds like it would be a hit with my son, he's in love with learning about mummies. Brush Mona Lisa's Hair sounds fascinating! Hard choice! Both Brush Mona Lisa's Hair and Make Van Gogh's Bed sound great! Catch Picasso's Rooster would be my first choice. I teach 2- and 3-year-olds, and I'm always looking for ways to expose them to beautiful (and approachable) art. Right now we're working on learning the ASL signs for animals and this book would totally tie in with our work. You have great giveaways - thank you! And I've blogged it, too! (and now I really must get to bed) Thanks again. I think Catch Picasso's Rooster would be a great book for my niece! I love any book that can also provide that sensory exploration! I'm sure all these childrens's books are great but I kinda like the Tickle Tut's Toes. It would be nice to win this for my granddaughter.